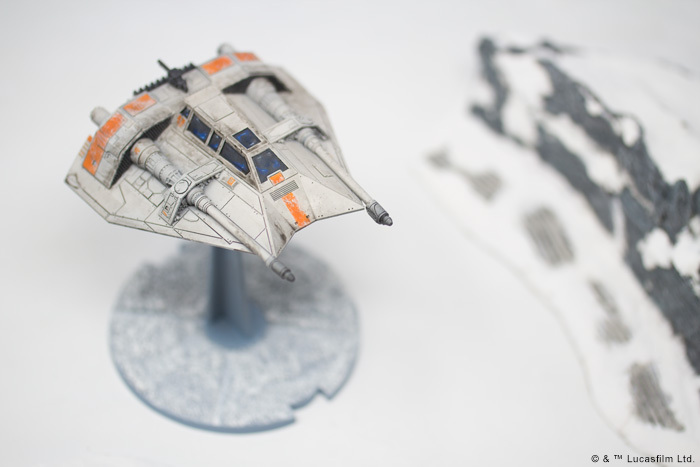 The T-47 Airspeeder takes to the skies above your armies. 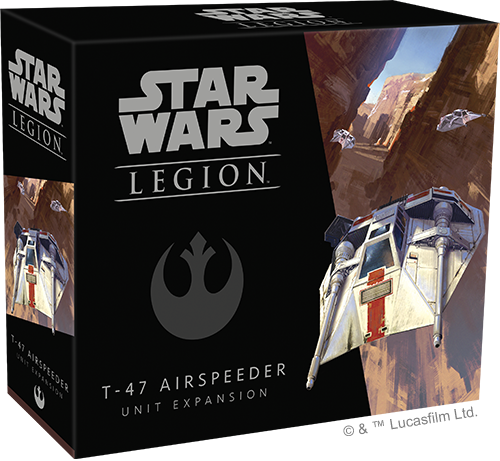 Pre-order your T-47 Airspeeder Unit Expansion at your local retailer or online through our website, then read on for more information! The T-47 airspeeder is a low-altitude assault speeder—perfectly suited for long-range reconnaissance and scouting in a hostile environment like Hoth, but also well suited to flying into battle. 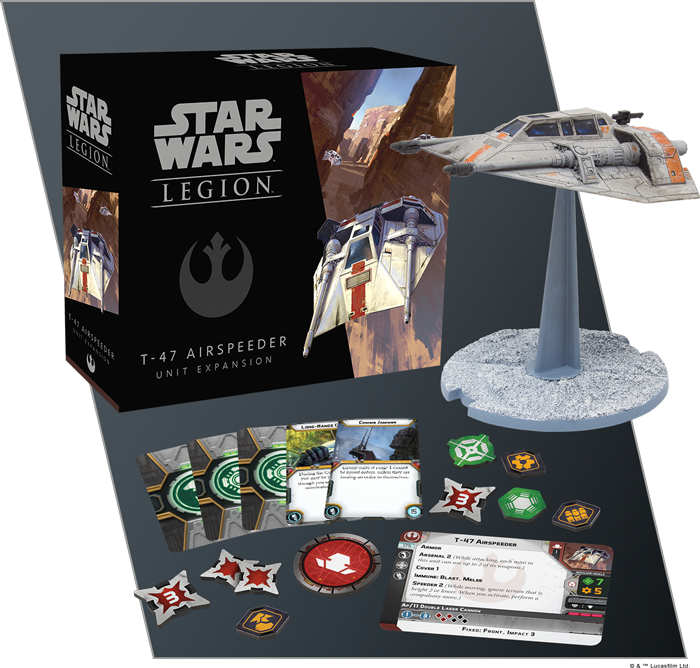 The T-47 airspeeder is the Rebellion’s first heavy unit for Star Wars: Legion, and as such, you can bring up to two of these fast-moving, dangerous repulsor vehicles into your army. Of course, the tactics that you choose to employ with such a unit are completely up to you, but it’s easy to see some of the most powerful applications of a T-47 airspeeder on the battlefield. With a speed of 3, this airspeeder ranks among the fastest units in the game, sending this miniature racing across the battlefield at lightning speed. 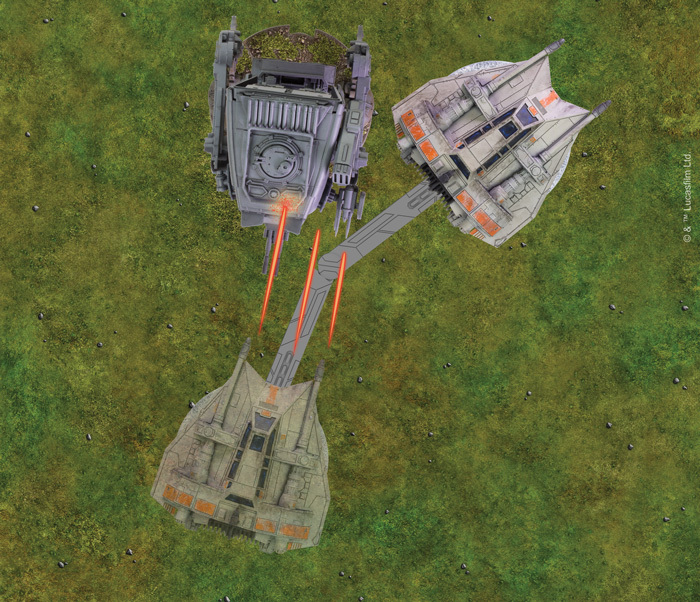 To add to its speed, the Speeder 2 keyword lets the T-47 fly straight over low terrain and forces it to perform a compulsory move when it activates. It’s easy to see, then, how you might choose to use the T-47 airspeeder as a strafing vehicle—racing up to the enemy front lines, firing, and then darting away once more. The T-47 Airspeeder fires at the AT-ST, then races past it, forcing it to pivot to return fire. Because your airspeeders are so fast-moving, they’re likely to range far from your commander’s sphere of influence—potentially making it impossible for your T-47 airspeeders to receive orders. This could cripple the tactical advantage of your airspeeders—unless you planned ahead and equipped your airspeeders with Long-Range Comlinks. 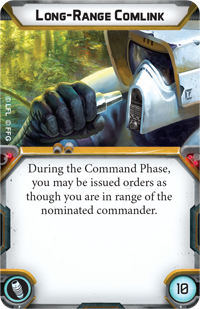 Issuing this upgrade card to a T-47 airspeeder means that you can always issue orders to it as though it were within range of your commander. In other words, no matter how far your T-47 airspeeders fly behind enemy lines or how fast they race across the battlfield, you’ll always be able to activate them exactly when you need to. Long-Range Comlinks are far from the only upgrade cards included in this Unit Expansion. The T-47 airspeeder has upgrade slots for comms, a hardpoint, and a pilot, and within this expansion, you’ll find upgrade cards that give you options for each of those slots. 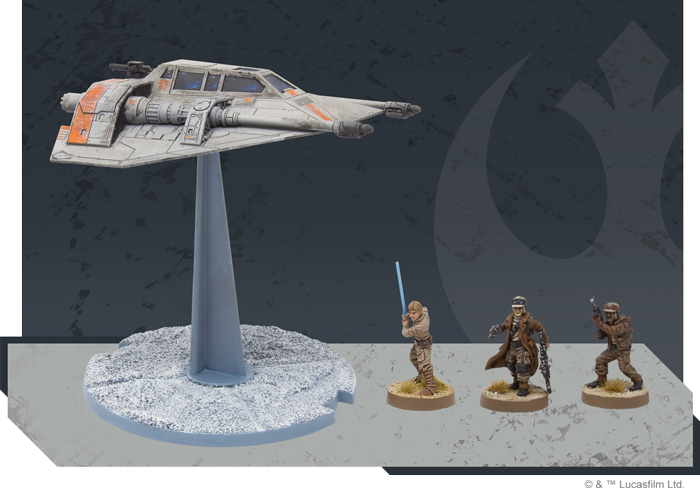 And while the T-47 airspeeder is undeniably customizable in a mechanical, in-game sense, the miniature itself is also customizable to reflect its place in your army. 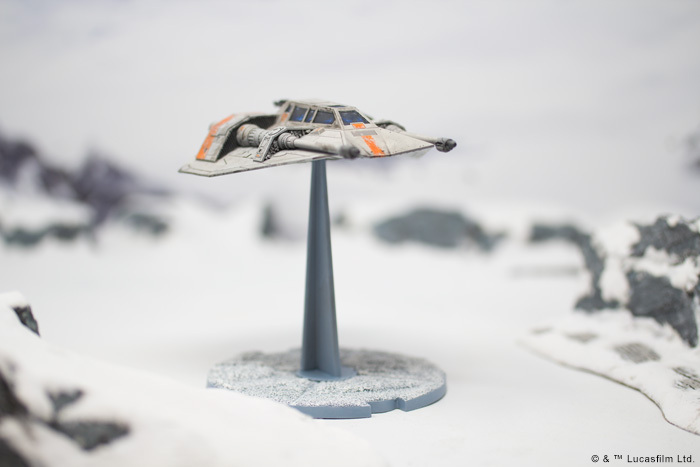 This miniature comes with two distinct weapons—the AX108 “Ground Buzzer” or the Mo/DK Power Harpoon—and you can customize the T-47 airspeeder miniature based on which weapon you’ve equipped. What’s more, the airspeeder’s trademark maneuvering flaps can be assembled in an open or closed position, inviting you to bring yet another unique touch to your Rebel army. Scramble Pilots to Their Ships! Whether you’re fighting a desperate retreat from the Rebel base on Hoth, or you’re taking the fight to the Empire on another battlefield of the Galactic Civil War, there’s no harm in exercising your air superiority. Look for the T-47 Airspeeder Unit Expansion in the first quarter of 2018! You can pre-order it at your local retailer or online through our website today.